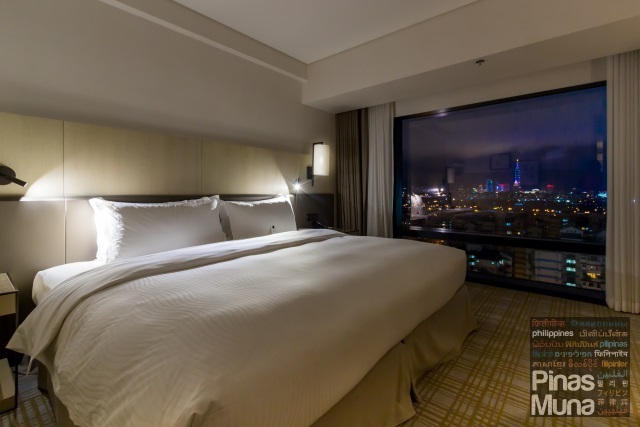 Taipei Marriott Hotel (台北萬豪酒店) is the newest five star hotel in Taipei mainly serving the Zhongshan and Neihu Districts of the city. 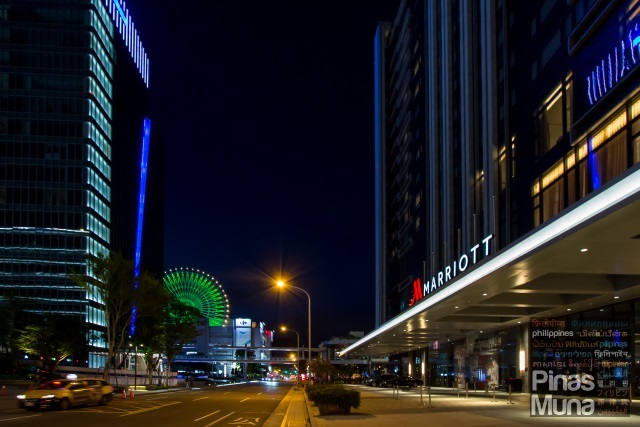 With its close proximity to the Neihu Tachnology Park, Taipei Marriott Hotel is the hotel of choice of by many business travelers from the United States, China, Japan, Europe and Taiwan. 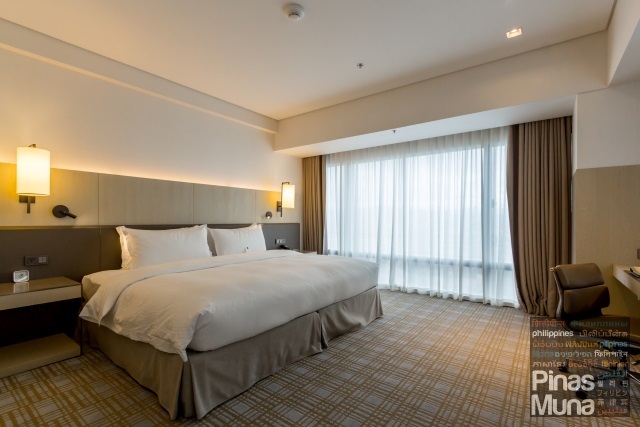 Taipei Marriott Hotel is also the closest international branded hotel to the Taipei Songshan Airport which serves domestic flights within Taiwan. 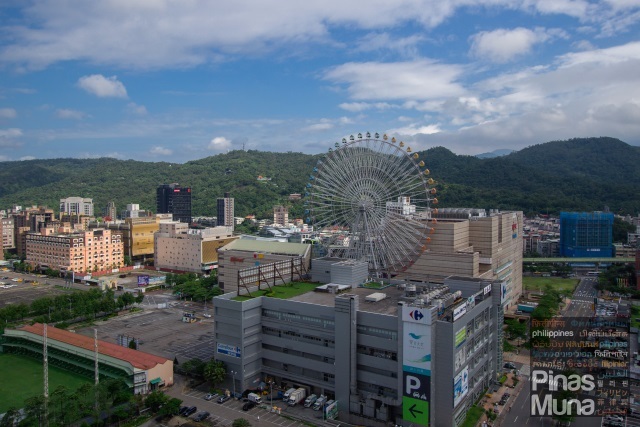 The airport is easily accessible from the hotel via the Wenhu Line (Brown Line) of the Taipei Metro, making it an ideal base for both business and lesiure travelers with connecting flight to various locations in Taiwan. The nearest station to the hotel is the Jiannan Road Station. International travelers arriving at the Taiwan Taoyuan International Airport can reach the hotel by taking the Taoyuan Airport MRT to the Taipei Main Station (NT$160) and from there, take the Bannan Line (Blue Line) of the Taipei Metro, transfer to the Wenhu Line (Brown Line) at the Zhongxiao Fuxing Station and alight at the Jiannan Road Station (NT$30). 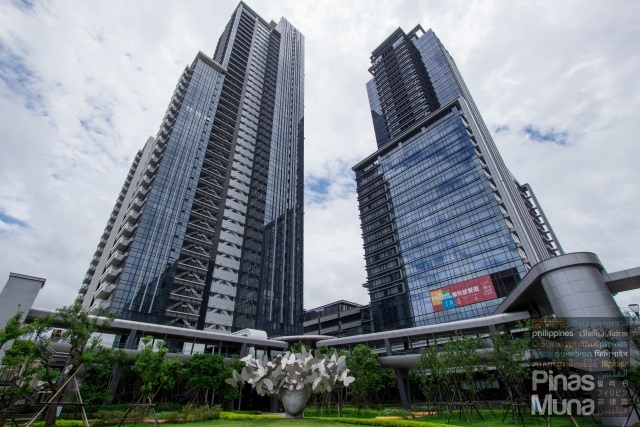 From Jiannan Road Station, Taipei Marriott Hotel is just three blocks away passing through Miramar Mall and Carrefour Dazhi. 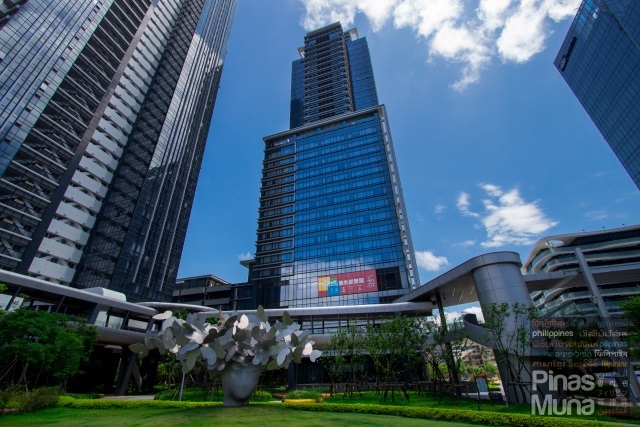 The hotel is easy to spot as it is one of the tallest buildings within the area. If you are traveling as a group, it can be more convenient to take a taxi (~NT$1,300) or book the hotel car (NT$2,800 one-way). As you approach the hotel, you will be welcomed by an aluminum sculpture created by Spanish artist Manolo Valdez. The sculpture features a human head crowned with butterflies. The artwork is inspired by a nearby butterfly reserve and serves as the centerpiece of a vast landscaped lawn of the hotel. 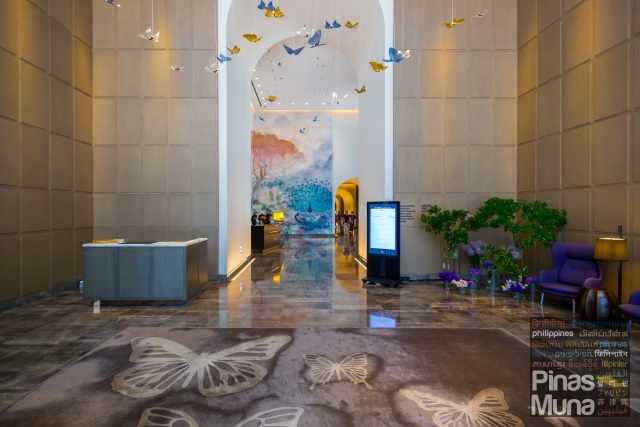 Entering the lobby, more butterflies, down on the carpet and up in the ceiling, will greet your arrival to Taipei Marriott Hotel. 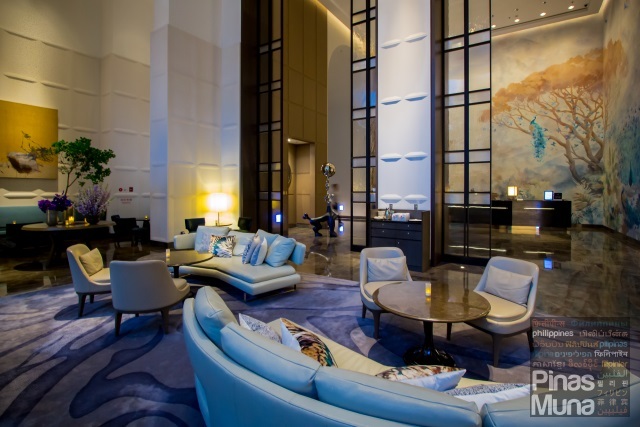 In addition, ornamental plants and flowers adorn every corner of the lobby. I was told that each glass butterfly hanging from the ceiling was individually made by hand. 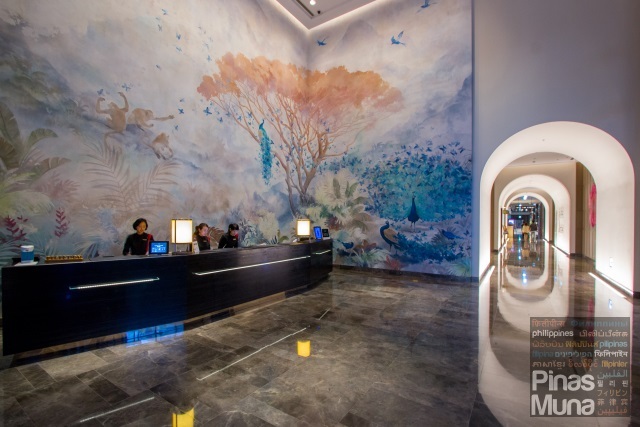 Nature meets art at the main lobby of Taipei Marriott Hotel. 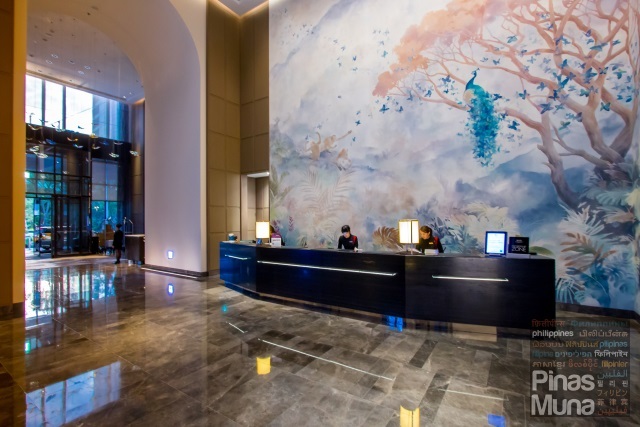 The feature wall behind the reception depicts Taiwan's Alishan Mountain Range through a 1200x900 centimeter acrylic painting by Moss & Lam of Canada. You will also notice that the painting incorporates butterflies in the details. 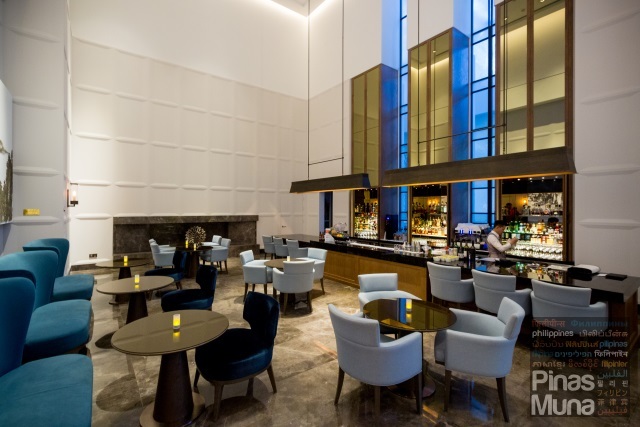 Adjacent to the lobby is Taipei Marriott Hotel's Lobby Lounge which serves snacks and drinks including espresso and tea based beverages as well as juices and cocktails. One of the most famous items from their menu is their Taiwanese Beef Noodle Soup. I arrived at the hotel at 1:00pm which was quite early for check-in, so I spent a good one hour at the lobby lounge working with my laptop until 2:00pm when my room was finally ready. I stayed in a Comfort Suite (Room 1505) which measures roughly 65 square meters. The suite has a separate living area which connects to a walk-through closet that leads to the bedroom. 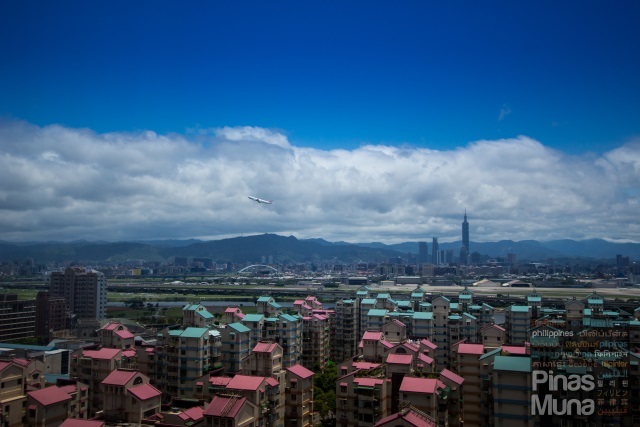 My suite is located on the 15th floor and is facing the Taipei Songshan Airport with the Taipei 101 at the background. The bedroom is fitted with a king bed with a goose down feather topper and duvet. The executive writing desk is also located inside the bedroom. The bedroom has it own 50-inch LED screen smart television with international cable and satellite HD channels. The living area has a three-seater sofa and a couch. 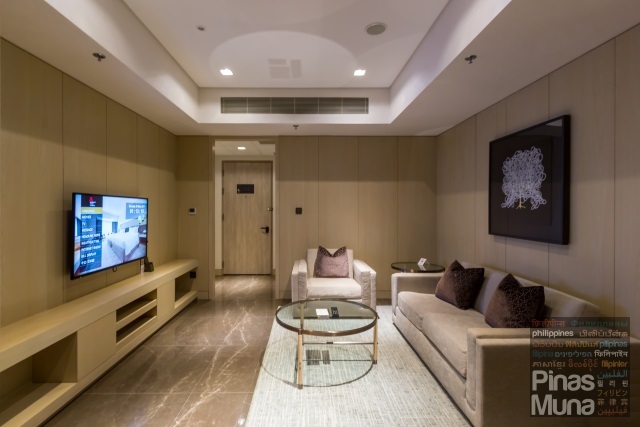 The living area is also equipped with a 50-inch LED screen smart television. I was able to watch news from Manila by connecting my smartphone wirelessly to the smart television. There's also a minibar with a mini-refrigerator as well as an electronic kettle. Plenty of tea and drip coffee were provided inside the minibar. The walk-in closet stores the bath robes, room slippers and the iron and ironing board. WiFi as well as wired internet connection is available inside the suite. The bathroom is equally spacious and is complete covered with marbles. There's a separate bathtub and walk-in shower. Hot and cold water are available through the his-and-hers basin and the rainfall shower. Thann branded body and bath amenities are provided. The water closet is equipped with an automated toilet which is a standard among luxury hotels in Taipei. 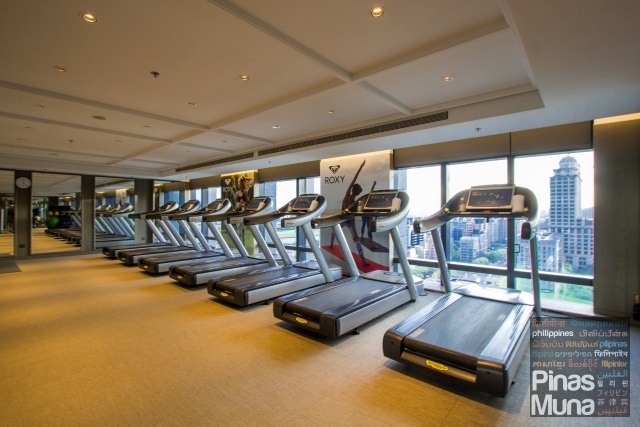 Taipei Marriott Hotel has a fitness center that is open 24 hours so whether you prefer to work out in the morning or in the afternoon, or if you wish to tire yourself during a sleepless night, you can always visit the fitness center on your most convenient time. 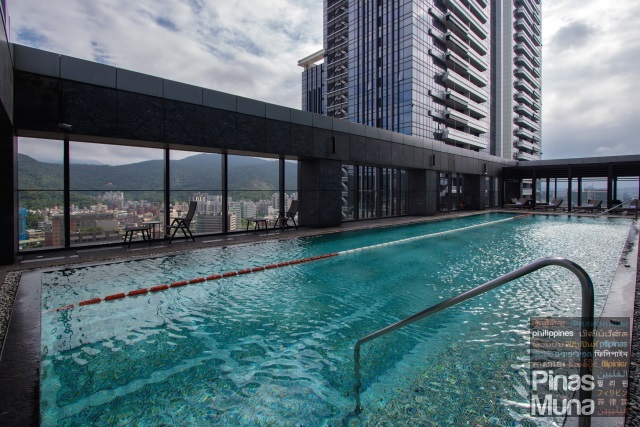 There is also a rooftop swimming pool located next to the fitness center. The water is heated and is perfect during the cold hours of the morning. If you prefer jogging or cycling, there are a lot of open spaces around the hotel. Taipei is one of the safest cities for joggers and cyclists. The nearby Meidi Riverside Park is one of the best spots for a morning jog. 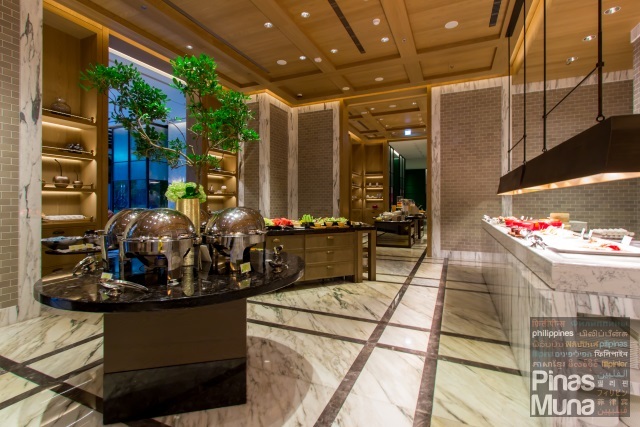 While staying at Taipei Marriott Hotel, you will never run out of dining options. Mark's Teppanyaki serves authentic Japanese teppanyaki with an innovative touch on taste and presentation. Open for lunch and dinner, Mark's Teppanyaki is a favorite among Japanese and Western guests who enjoy fine quality Japanese food while being entertained by live cooking action. 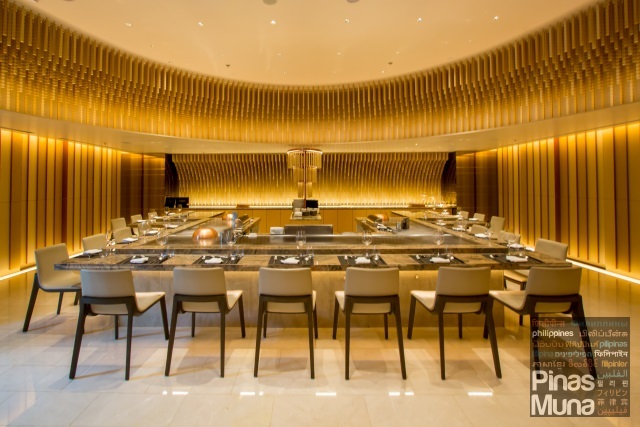 The Dining Place is Taipei Marriott Hotel's Chinese restaurant serving Cantonese and Sichuan cuisines. 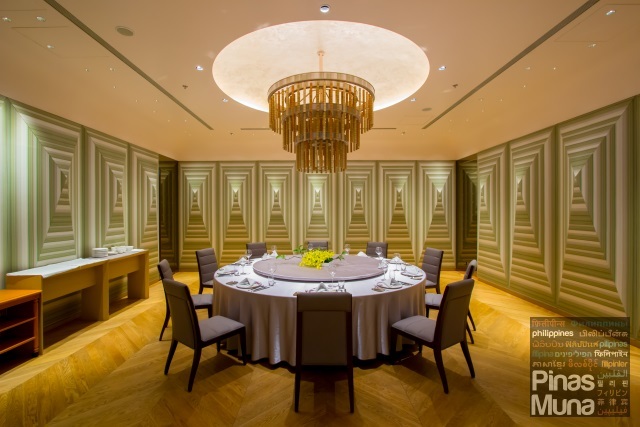 Elegant private dining rooms are popular among families and corporate functions, while the main dining area caters to small groups. Prior reservation is recommended as the restaurant is usually full especially during dinnertime. I didn't really prepare an itinerary when I visited Taipei as I don't really want to be bound by schedules and I prefer it to be spontaneous. The hotel's front office and concierge were a big help when it comes to providing directions and recommendations. They helped me locate a store where I could buy a local SIM card, and they also gave recommendations for dishes to try at the night market. Of course, a trip to Taipei is not complete without visiting a night market. 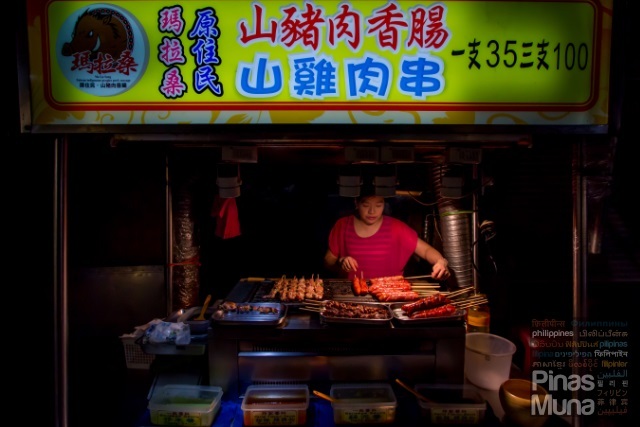 Night markets are scattered around Taipei, and two of the most popular ones are Shilin Night Market and Raohe Street Night Market. 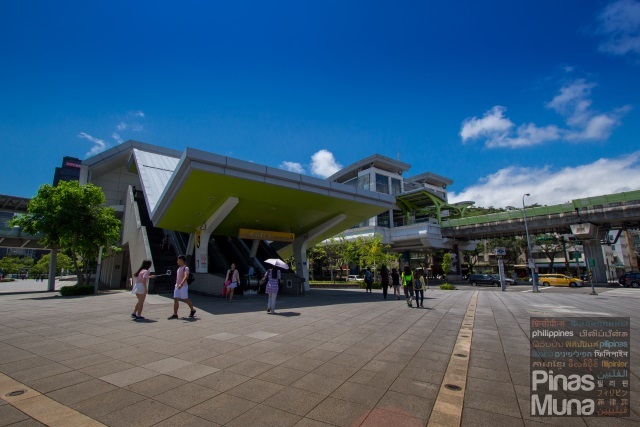 Both are easily accessible through the Taipei Metro. 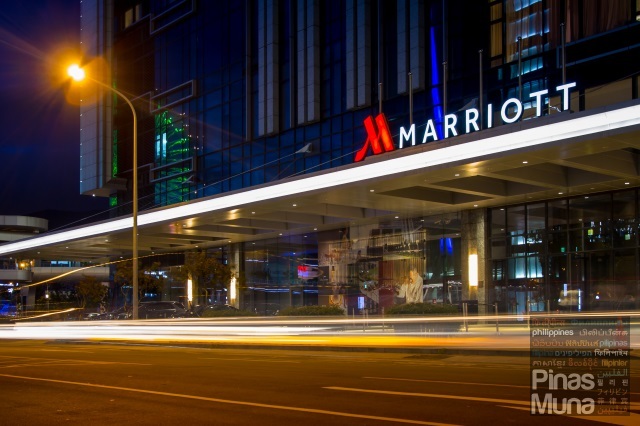 You can also take a taxi from Taipei Marriott Hotel. Just make sure that you ask the concierge to the write name of the night market in Chinese to make sure that the driver knows where you want to go. Also, don't forget to ask for the hotel's business card in Chinese. I recommend that you take Uber instead as it is most often cheaper than taking a taxi, but make sure that you have a local SIM card to make it possible to communicate with your driver. After visiting Shilin Night Market, I went back to the hotel and spent the rest of the evening watching a movie in my bedroom. After the movie, I took a quick shower and went straight to bed. The bed's mattress was very comfortable to the back regardless of your sleeping position. The linens were very fine and soft to the skin. The pillows were very soft but had enough firmness to support the neck. 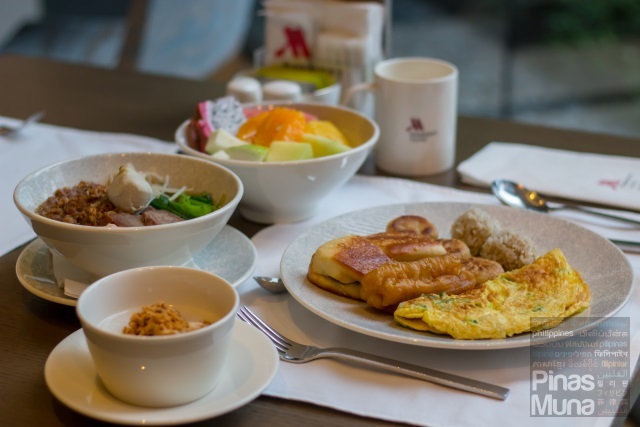 An overnight stay at Taipei Marriott Hotel comes with a complimentary buffet breakfast for two persons at the Garden Kitchen, the hotel's all-day dining restaurant. 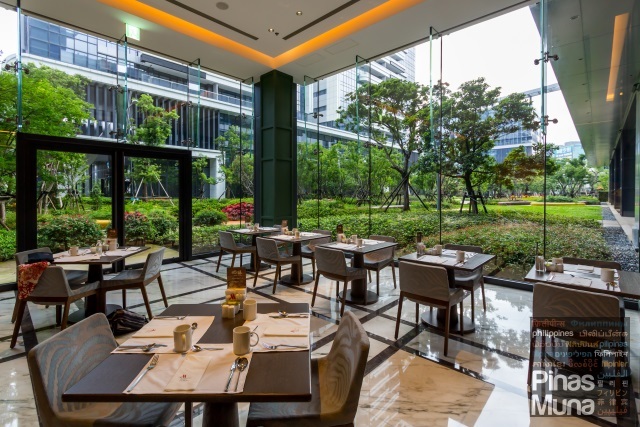 The restaurant has a floor to ceiling glass wall and is bathed with lots of natural light coming from the adjacent garden. Private dining spaces are also available. The buffet features both Western and Asian dishes. There's a continental section with breads, viennoiserie, cheeses and charcuterie. Cereals and fruit juices are also available. It also has an impressive spread of fresh fruits and vegetables. There's an extensive selection of Chinese, Korean and Japanese warm dishes, as well as a station featuring Taiwanese breakfast items, including xiao long bao! My breakfast consisted of scallion omelet served with fried bread stick and sesame pancakes. I also had congee topped with salted egg and pork floss. My favorite is the Taiwan dan-zi noodle. I also had assorted fresh fruits and a mug of warm soy milk. 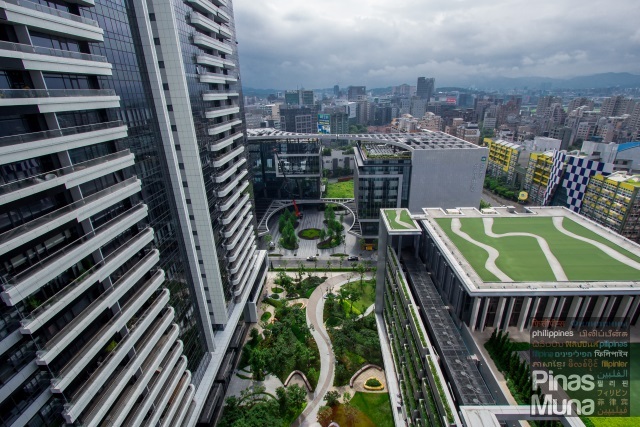 When visiting Taipei, most tourists would generally prefer a hotel in the Xinyi District where most of the touristy areas are located. 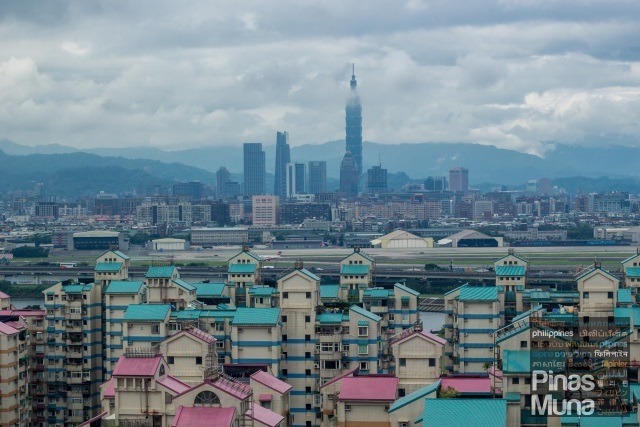 I, on the other hand, prefer to stay on a quieter side of the city, and this makes perfect sense in Taipei where everything is easily reachable by train or taxi. Taipei Marriott Hotel perfectly meets this requirement. The surrounding streets are quieter, there are a lot of green spaces, and should I wish to transport myself to the chaotic city center, I can simply hop in a taxi or take the metro. At the end of the day, all we want is a good night sleep don't we?